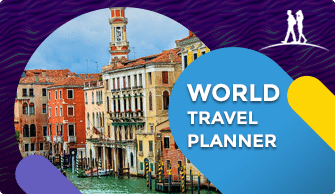 Today we are going to list all of the UNESCO World Heritage Sites in India. As of 2018, India has 36 heritage sites, the sixth most of any country. Sit back tight and enjoy the photos from some of the magnificent sites ever built. 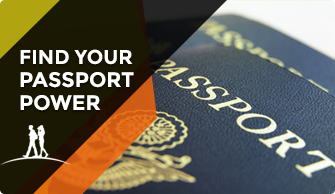 Or better yet, plan your next trip. The sites are grouped and listed based on geographical proximity, so if you are planning an India visit, you can plan your itinerary accordingly to cover some or all of them in the most efficient and cheapest way possible. 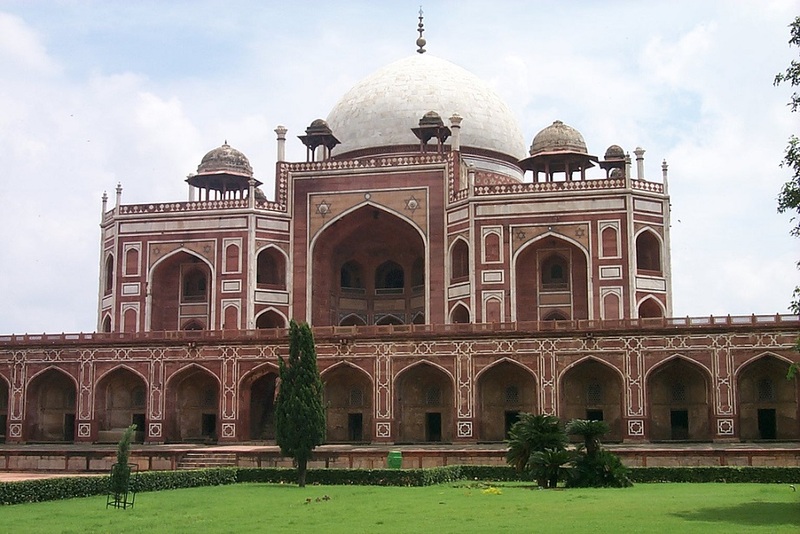 Humayun’s Tomb in Delhi was the precursor monument to the Taj Mahal (built a century later). Set at the center of luxurious gardens with water channels, it was built by the second Mughal Emperor Humayun’s widow Biga Begum (Hajji Begum). Its Mughal architectural style has been acclaimed as the “Necropolis of the Mughal dynasty” for its double-domed elevation provided with Chhatris. Apart from the tomb of Humayun, the funerary also has 150 tombs of various members of the royal family. It has a number of water channels, a pavilion, and a bath. The tomb set on an irregular octagonal plinth has a raised dome, covered by marble slabs and decorated with Chhatris. Qutb Minar is located south of Delhi. It is a tall red sandstone tower. Built at the beginning of the 13th century, the complex of structures comprises the Alai Darwaza Gate, the Alai Minar (an incomplete mound of the intended tower), the Qubbat-ul-Islam Mosque (the earliest existing mosque in India), the tomb of Iltumish, and an Iron Pillar without any rusting. The complex is a testimony to the Islamic depredations during the period as seen from the materials used for building the complex which are those that were removed after destroying Hindu and Jain temples. Red Fort (Lal Qila) is a palace fort built in the 17th century by Shahjahan, the fifth Mughal emperor as part of his new capital city of Shahjahanabad. Located to the north of Delhi, it represents the glory of the Mughal rule and is considered the Highpoint of Mughal architectural, artistic aesthetic creativity. The architectural design of the structures built within the fort represents a blend of Persian, Timuri and Indian architectural styles. Isfahan, the Persian Capital is said to have provided the inspiration to build the Red Fort Complex. The planning and design of this complex, in a geometrical grid plan with pavilion structures, was the precursor of several monuments which were built later in Rajasthan, Delhi, Agra and other places. The palace complex has been fortified by an enclosure wall built with red sandstone (hence the name Red Fort). Chosen from the work of Le Corbusier, the 17 sites comprising this transnational serial property are spread over seven countries. Urban and Architectural Work of Le Corbusier in Chandigarh is home to numerous architectural projects of Le Corbusier, Pierre Jeanneret, Matthew Nowicki and Albert Mayer. Both Nanda Devi National Park and Valley of Flowers National Park are nestled high in Western Himalaya. Valley of Flowers National Park is renowned for its meadows of endemic alpine flowers and outstanding natural beauty. This richly diverse area is also home to rare and endangered animals, including the Asiatic black bear, snow leopard, brown bear and blue sheep. The gentle landscape of the Valley of Flowers National Park complements the rugged mountain wilderness of Nanda Devi National Park. Together, they encompass a unique transition zone between the mountain ranges of the Zanskar and Great Himalaya. Great Himalayan National Park, in Kullu, Himachal Pradesh, is characterized by high alpine peaks, alpine meadows, and riverine forests. The Upper Mountain glacial and snow melt water source origins of several rivers, and the catchments of water supplies that are vital to millions of downstream users. It is part of the Himalaya biodiversity hotspot and includes 25 forest types along with a rich assemblage of fauna species, several of which are threatened. Taj Mahal, one of the Seven Wonders of the World is a mausoleum – a funerary mosque. It was built by Emperor Shahjahan in memory of his third wife Begum Mumtaz Mahal who had died in 1631. It is a large edifice made in white marble in typical Mughal architecture, a style that combines elements from Persian, Islamic, and Indian architectural styles. This much-acclaimed masterpiece was built over a 16-year period set amidst vast Mughal Gardens on the right bank of the Yamuna River. It has an octagonal layout marked by four exclusive minarets at four corners with a pristine elevation of a central bulbous dome below which the tombs are laid in an underground chamber. Calligraphic inscriptions in-crusted in polychromatic pierra dura, decorative bands, and floral arabesques glorify the monument’s graphic beauty and provide a picture perfect impression to the viewers. Agra Fort, also known as the Red Fort of Agra, which represented Mughal opulence and power as the centerpiece of their empire. The fortress located on the right bank of the Yamuna River, built in red sandstone, and surrounded by a moat, encloses several palaces, towers, and mosques. It is very close to the famous Taj Mahal with a buffer zone separating the two monuments. These monuments are remarkable for the fusion of Persian art of the Timurid and the Indian art form. Agra Fort was built from the 16th century onwards till the early 18th century. The impressive structures within the precincts of the fort are the Khas Mahal, the Shish Mahal, Muhamman Burje (an octagonal tower), Diwan-i-Khas, Diwan-i-Am, white marble mosque or the Pearl Mosque, and the Nagina Masjid. Fatehpur Sikri, “the City of Victory”, was built during the second half of the 16th century by the Mughal Emperor Akbar. It was the capital of the Empire and seat of the grand Mughal court for 14 years. Despite bearing exceptional testimony to the Mughal civilization at the end of the 16th century, it had to be abandoned due to the twin reasons of lack of water and unrest in north-west India, leading the emperor to shift the capital to Lahore. The complex of monuments and temples, all uniformly in Mughal architectural style, includes one of the largest mosques in India, the Jama Masjid, the Buland Darwaza, the Panch Mahal, and the Tomb of Salim Chishti. The Jantar Mantar in Jaipur is a collection of architectural astronomical instruments, built by Maharaja Jai Singh at his then new capital of Jaipur between 1727 and 1734. It is modeled after the one that he had built at the Mughal capital of Delhi. He had constructed a total of 5 such facilities at different locations, including the ones at Delhi and Jaipur. The Jaipur observatory is the largest and best preserved of these and has a set of some 20 main fixed instruments built in masonry. Keoladeo National Park in Bharatpur is located within the Indus-Ganges Monsoon Forest Biogeographical Province. The area of the wetland of the park shrinks to a mere 2500 acres during most part of the year. It has a human-built environment created partly by embankments dividing the area into 10 units, and has sluice controlled arrangement to maintain the water level. It is famous for 364 species of wintering birds that flock in large numbers, arriving from distant countries of Afghanistan, Turkmenistan, China, and Siberia. Hill Forts of Rajasthan, are a series of sites located on rocky outcrops of the Aravallis mountain range in Rajasthan. They represent a typology of Rajput military hill architecture, a style characterized by its mountain peak settings, utilizing the defensive properties of the terrain. These hill forts in Rajasthan represent Rajput military strongholds across a vast range of geographical and cultural zones. They enclose large territories and even complete villages in walled compounds. The property consists of Chittor Fort, Kumbhalgarh Fort, Ranthambore Fort, Gagron Fort, Amer Fort, Jaisalmer Fort. These fort complex includes palaces, Hindu and Jain temples, urban centers and trading centers. Champaner-Pavagadh Archaeological Park is situated in Panchmahal district in Gujarat, India. There is a concentration of largely unexcavated archaeological, historic and living cultural heritage properties cradled in an impressive landscape which includes prehistoric sites, a hill fortress of an early Hindu capital, and remains of the 16th-century capital of the state of Gujarat. The site also includes, among other vestiges, fortifications, palaces, religious buildings, residential precincts, agricultural structures and water installations, from the 8th to the 14th centuries. The Kalikamata Temple & Jain Temple on top of the Pavagadh Hill is considered to be an important shrine, attracting large numbers of pilgrims throughout the year. The site is the only complete and unchanged Islamic pre-Mughal city. Rani ki vav (The Queen’s Stepwell) at Patan, Gujarat, is a famous stepwell. It is famous for its size and sculpture. The length of Rani ki Vav is more than 64m long, 20m wide, and 27m deep and there are more than 500 sculptures of god. Most of the sculptures are in devotion to Vishnu, in the forms of Dus-Avatars Kalki, Rama, Mahisasurmardini, Narsinh, Vaman, Varahi and others representing their return to the world. Also it has Nagkanyas, Yoginis, Apsaras (beautiful women) showcasing 16 different styles of makeup to look more attractive called “Solah-shringar”. The walled city of Ahmadabad, founded by Sultan Ahmad Shah in the 15th century, on the eastern bank of the Sabarmati river, presents a rich architectural heritage from the sultanate period, notably the Bhadra citadel, the walls and gates of the Fort city and numerous mosques and tombs as well as important Hindu and Jain temples of later periods. The urban fabric is made up of densely-packed traditional houses in gated traditional streets with characteristic features such as bird feeders, public wells, and religious institutions. The city continued to flourish as the capital of the State of Gujarat for six centuries, up to the present. Ajanta Caves are Buddhist caves that were built in two phases. The caves depict richly decorated paintings, frescoes, which are reminiscent of the Sigiriya paintings in Sri Lanka and sculptures. As a whole, there are 31 rock-cut cave monuments which are unique representations of the religious art of Buddhism. Ellora Caves are a cultural mix of religious arts of Buddhism, Hinduism, and Jainism. These are 34 monasteries and temples sculpted contiguously into rock walls of a high basalt cliff, which are seen along a length of 2 km (1.2 mi). Dated to 600 to 1000 AD, they are a reflection of artistic creation of the ancient civilization of India. The Elephanta Caves are a network of sculpted caves located on Elephanta Island, or Gharapuri (literally “the city of caves”) in Mumbai Harbour, 10 km (6.2 mi) to the east of the city of Mumbai. 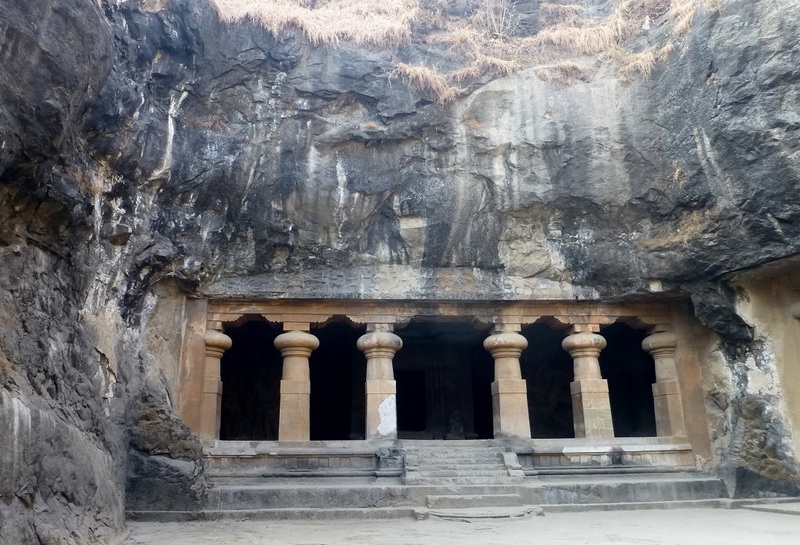 The island, located on an arm of the Arabian Sea, consists of two groups of caves — the first is a large group of 5 Hindu caves, the second, and a smaller group of 2 Buddhist caves. The Hindu caves contain rock cut stone sculptures, representing the Shaiva Hindu sect, dedicated to the god Shiva. The rock-cut architecture of the caves is dated to between the 5th and 8th centuries, although the identity of the original builders is still a subject of debate. Chhatrapati Shivaji Terminus is a historic railway station in Mumbai, which serves as the headquarters of the Central Railways. It is one of the busiest railway stations in India, and serves Central Railway trains terminating in Mumbai as well as the Mumbai Suburban Railway. This famous architectural landmark in Gothic style was built as the headquarters of the Great Indian Peninsular Railway. It took ten years to complete. Churches and Convents of Goa are monuments built by the Portuguese colonial rulers of Goa between 16th and 18th centuries. These monuments are mainly in the former capital of Old Goa. The most significant of these monuments is the Basilica of Bom Jesus, which enshrines the tomb containing the relics of St. Francis Xavier. These monuments of Goa, known as the “Rome of the Orient,” were established by different Catholic religious orders. There were originally 60 churches of which some of the surviving monuments are the Saint Catherine’s Chapel, the Church and Convent of Saint Francis of Assisi, the Jesuit Borea Jezuchi Bajilika, Asisachea Sanv Fransiskachi Igorz, the church of Saint Cajetan and its seminary, Church of Our Lady of the Rosary, and Church of Saint Augustine. The Group of Monuments at Hampi comprise a somber but ostentatious Hampi town, on the banks of the river Tungabhadra in Karnataka. Hampi, as an important Hindu & Jain religious center. Dravidian temples and palaces abound in Hampi. These won the admiration of travelers between the 14th and 16th centuries. 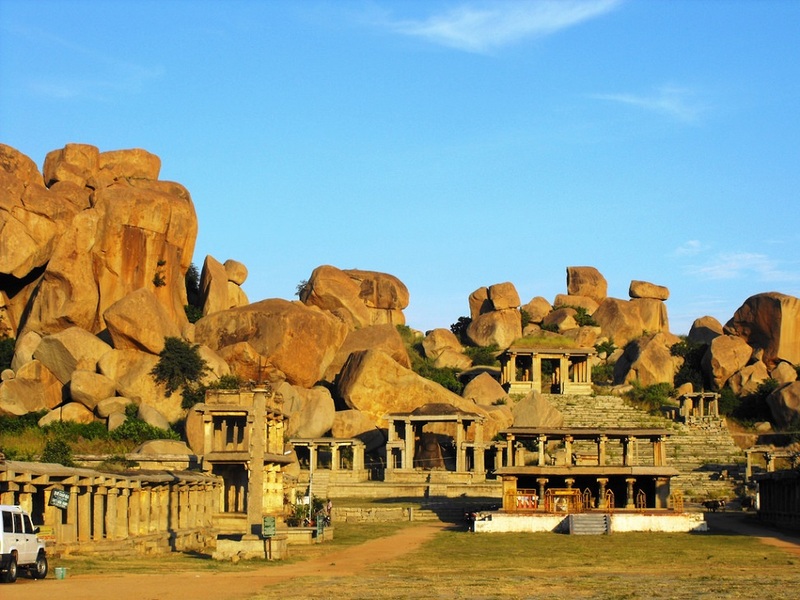 Hampi subsumes the ruins of Vijayanagara, which was the former capital of the powerful Vijayanagara Empire. The Group of monuments in Pattadakal cover a remarkable series of nine Hindu temples, as well as a Jain sanctuary in northern Karnataka. In this group of temples, the Virupaksha Temple, built in 740 AD by Queen Lokamahadevi to commemorate her husband’s victory over the Pallava kings from the south, is considered the most outstanding architectural edifice. These are a remarkable combination of temples built by the Chalukya Dynasty in the 6th to 8th century at Aihole, Badami and Pattadakal, the latter city was known as the “Crown Rubies”. The temples represent a remarkable fusion of the architectural features of northern (Nagara) and southern (dravida) India. Pattadakal is considered a Hindu holy city and within the heritage complex are eight temples dedicated to Shiva, a ninth shaivite sanctuary called the Papanatha Temple, and a Jain Narayana temple. The Great Living Chola Temples, built by kings of the Chola Empire stretched over all of Tamil Nadu. This cultural heritage site includes three great temples of 11th and 12th centuries namely, the Brihadisvara Temple at Thanjavur, the Brihadisvara Temple at Gangaikondacholisvaram and the Airavatesvara Temple at Darasuram. The Group of Monuments at Mahabalipuram, in Tamil Nadu, about 58 km from Chennai, were built by the Pallava kings in the 7th and 8th centuries. These monuments have been carved out of rock along the Coromandel Coast. The temple town has approximately forty monuments, including the largest open-air bas-relief in the world. The monuments inscribed are the Ratha Temples: Temples in the form of chariots, Mandapas, 11 Cave sanctuaries covered with bas-reliefs, rock relief of Descent of the Ganges, which is the largest open air Rock relief also known as Arjuna’s Penance or Bhagiratha’s Penance. Mahabodhi Temple Complex at Bodh Gaya is a unique property of cultural and archaeological importance. The first temple was built by Emperor Ashoka in 260 BC around the Bodhi Tree Ficus religiosa (to the west of the temple). Revered and sanctified as the place where Siddhartha Gautama Buddha was enlightened in 531 BC at age 35, and then propagated his divine knowledge of Buddhism to the world, it has been the ultimate temple for reverential worship, over the last several centuries, by Buddhists of all denominations, from all over the world who visit on pilgrimage. The main temple is 50 m in height, built in Indian architectural style, dated between 5th and 6th centuries, and it is the oldest temple in the Indian sub-continent built during the “Golden Age” of Indian culture credited to the Gupta period. The Nalanda Mahavihara site in Bihar comprises the archaeological remains of a monastic and scholastic institution dating from the 3rd century BCE to the 13th century CE. It includes stupas, shrines, viharas (residential and educational buildings) and important art works in stucco, stone and metal. Nalanda stands out as the most ancient university of the Indian Subcontinent. It engaged in the organized transmission of knowledge over an uninterrupted period of 800 years. The historical development of the site testifies to the development of Buddhism into a religion and the flourishing of monastic and educational traditions. 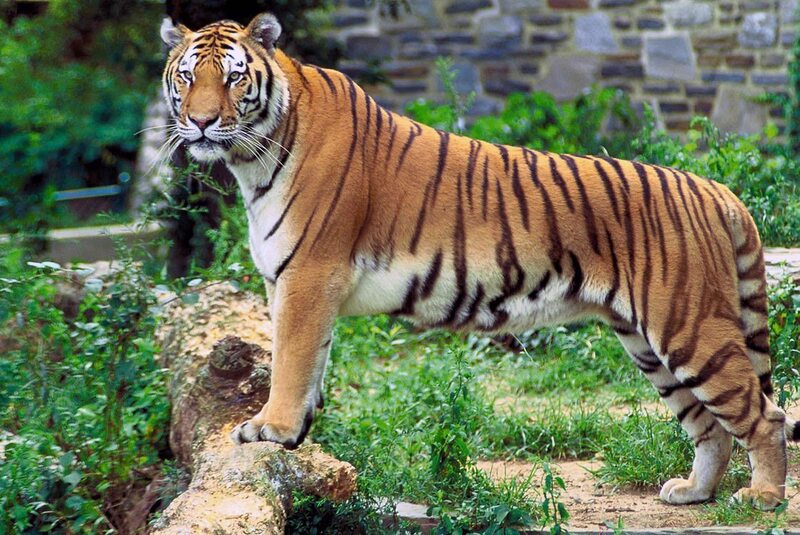 The Sundarbans National Park, the largest estuarine mangrove forest in the world is a national park, tiger reserve, UNESCO World Heritage Site, and a biosphere reserve located in the Sundarbans Ganges river delta bordering the Bay of Bengal, in West Bengal. This region is densely covered by mangrove forests, and is one of the largest reserves for the Bengal tiger. It is also home to a variety of bird, reptile and invertebrate species, including the salt-water crocodile. Konark Sun Temple is a 13th-century Sun Temple in Odisha. Located on the east coast of the Bay of Bengal in the Mahanadi Delta, it is built in the form of the chariot of Surya, the sun god with 24 wheels, and is heavily decorated with symbolic stone carvings and led by a team of six horses. It was constructed from oxidizing weathered ferruginous sandstone and is one of the most renowned temples in India. Buddhist Monuments at Sanchi, located 45 km (28 mi) from Bhopal in the Indian state of Madhya Pradesh are a group of Buddhist monuments dated between 200 BC and 100 BC. The site, however, has been conjectured to have been developed in the 3rd century BC, when Emperor Ashoka of the Mauryan Empire ruled. The principal monument is a Stupa dated to the 2nd century and 1st century BC. These Buddhist sanctuaries were active Buddhist religious monuments, which flourished till the 12th century. The sanctuary has a plethora of monolithic pillars, palaces, temples and monasteries in different status of preservation. Rock Shelters of Bhimbetka described in the UNESCO Inscription as “a magnificent repository of rock paintings within natural rock shelters” is located in the foothills of the Vindhya Hill Range in the Central Indian state of Madhya Pradesh. It is spread in sandstone formations. The rock shelters comprise a group of “five clusters of rock shelters” with paintings that are inferred to date from the “Mesolithic period right through to the Historical period”, with the 21 villages surrounding them reflecting the traditions displayed in the rock paintings. The unique rock art has been discovered in 400 painted shelters spread over a vast area amidst a forest with high diversity of flora and fauna, with some of the shelters dating back to 100,000 BC to 1000 AD. 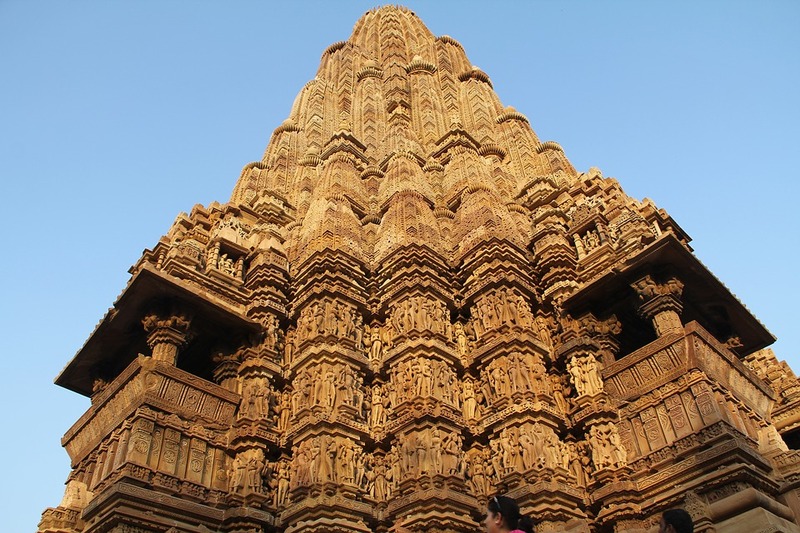 Khajuraho Group of Monuments belong to both the Hindu and Jain religious practices with striking fusion of stone sculpture and architecture. The best example of this outstanding feature is seen in the Kandariya Temple. Of the 85 temples built, only 22 temples have survived. Located in the Indian state of Madhya Pradesh, it is renowned for its unique original artistic creation and proof of the Chandela Culture that existed prior to the Muslim invasion of India in the early 12th century. The stone walls of temples are decorated with a profusion of sculptures with intricate details, tantric symbolism, and sexual expressiveness of ancient Indian art. Kaziranga, located in the Northeastern state of Assam in the flood plains of the Brahmaputra River’s south bank. It was established as a reserved forest in 1908 to protect the dwindling species of rhinoceros. This large park, which covers 106,250 acres of land has the distinction of being home to the largest population of the great Indian one-horned rhinoceros. There are many other mammals and birds species protected in the sanctuary. Manas Wildlife Sanctuary is located in the northeastern state of Assam. It is in the plains of the Manas River in the foot hills of the Himalayas, on the border with Bhutan (contiguous with the Manas Wildlife Sanctuary in Bhutan). The sanctuary is the habitat of several species of plants, 21 most-threatened species of mammals (out of 55 mammal species in the sanctuary), 36 reptile species, 3 amphibians and 350 species of birds. Endangered species include tiger, pygmy hog, clouded leopard, sloth bear, Indian rhinoceros, wild buffaloes (the only pure strain of buffalo in India), Indian elephants, golden langur and Bengal florican. Located at the heart of the Himalayan range in northern Indian State of Sikkim, the Khangchendzonga National Park includes a unique diversity of plains, valleys, lakes, glaciers and spectacular, snow-capped mountains covered with ancient forests, including the world’s third highest peak, Mount Khangchendzonga. 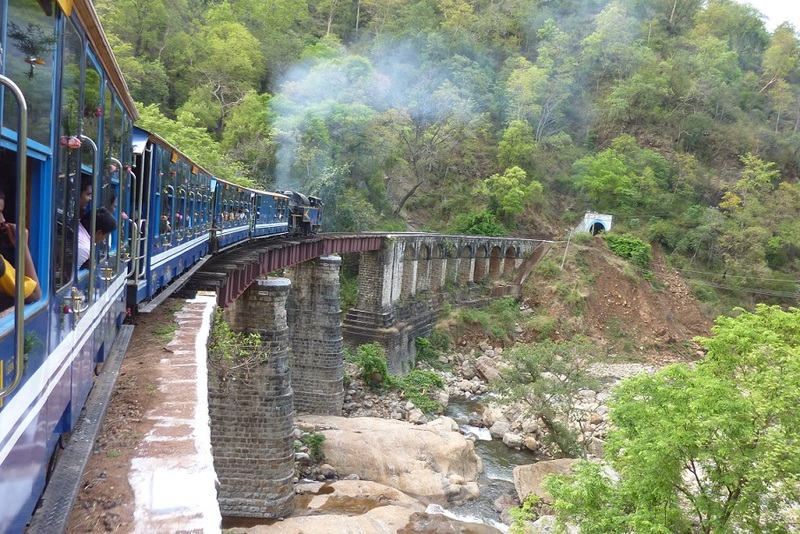 The Mountain Railways of India represents a collective listing of the Darjeeling Himalayan Railway, the Nilgiri Mountain Railway, and the Kalka-Shimla Railway under the UNESCO World Heritage Site. Two railways, the Darjeeling Himalayan Railway (1881) and the Kalka-Shimla Railway (1898) are located in the rugged hill regions of the Himalayas of Northern India and the other two, the Nilgiri Mountain Railway (1908) and the Matheran Hill Railway (1907) are located in the rugged hill regions of the Western Ghats of Southern India. So, which of these UNESCO Sites in India have you visited? 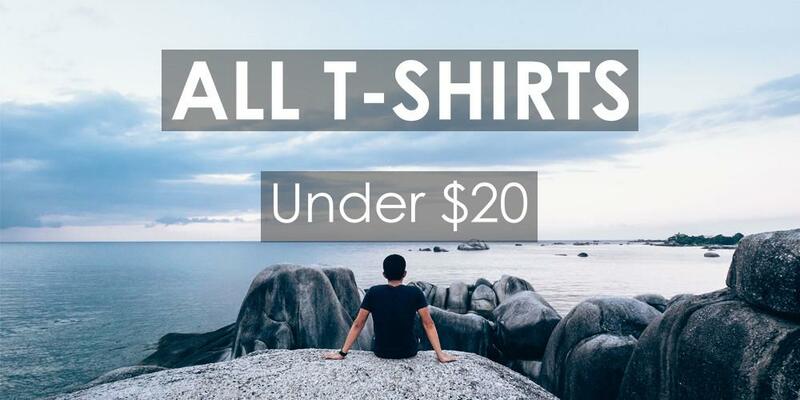 Which ones are on your list? 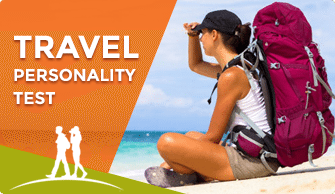 Please share your travel stories and tips in the comments below.